'Grim' mood outside Soma mine Jump to media player A miner who lost friends and relatives in the Soma mine disaster been talking about the mood at their funerals, as others wait for news of their loved-ones. 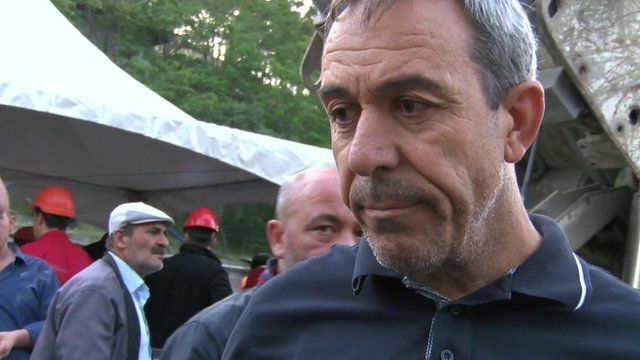 Grieving father waits for miner son's body Jump to media player BBC Turkish's Selin Girit talks to a grieving father who is waiting for the body of his 24-year-old son to be retrieved from the Soma mine. President: Turkey must unite Jump to media player Turkey "must unite" following a mine disaster that claimed at least 282 lives, the country's president has said. Anger on streets after mine disaster Jump to media player Trade unions in Turkey have announced a one-day strike in protest at the country's worst ever mine disaster which has claimed at least 282 lives. Mine relatives 'will not leave' Jump to media player Relatives of around 150 miners missing after a deadly explosion in eastern Turkey are maintaining a vigil at the site of the disaster. Turkey mine clashes spread to cities Jump to media player Protesters angry at the Soma mine disaster have clashed with police in the Turkish cities of Istanbul and Ankara. A miner who lost friends and relatives in the Soma mine disaster been talking about the mood at their funerals, as others wait for news of their loved-ones. The BBC's Selin Girit, outside the mine, says that the hopes of finding any survivors have been extinguished, and all people can do is wait.